Kwak Hye-sook held up a picture of her husband. Choi In-gi, who died three years ago at the age of 60, was shown lying in critical care with several different hoses attached to him. Kwak let out a deep sigh as her tears began to flow. Choi In-ki was an express city bus driver. After an aortic aneurysm diagnosis in 2005, he underwent two major operations in 2008 to have the blood vessels around his heart replaced with artificial ones. An aortic aneurysm is a serious condition in which blood vessels could fatally swell and burst at any moment. Left unable to work, Choi was selected as a basic livelihood benefit recipient and received support for living and hospital expenses. A conditional beneficiary cannot receive part or any of livelihood benefits unless he or she fulfills certain conditions for rehabilitation, such as obtaining employment. In June 2014, Choi was finally forced to find work as part of the cleanup crew at an apartment complex. Three months later, he collapsed in an underground parking garage; two months after that, he passed away. On Aug. 28, the third anniversary of Choi’s death, his widow Kwak joined the MINBYUN-Lawyers for a Democratic Society Public Interest Human Rights Legal Defense Center in filing suit against NPS and the city of Suwon. During an Aug. 30 press conference at MINBYUN’s office in Seoul’s Seocho neighborhood, the group referred to Choi’s death as “the result of unrealistic working capability assessments.” MINBYUN said it was the first lawsuit holding the state accountable for the death of a social welfare beneficiary. Kwak and the group described Choi’s death as a Korean version of I, Daniel Blake, a film by director Ken Loach about a man who is forced to find work to meet conditions for benefit payment like Choi. In the film, the character dies while his case is being reheard by a public institution. 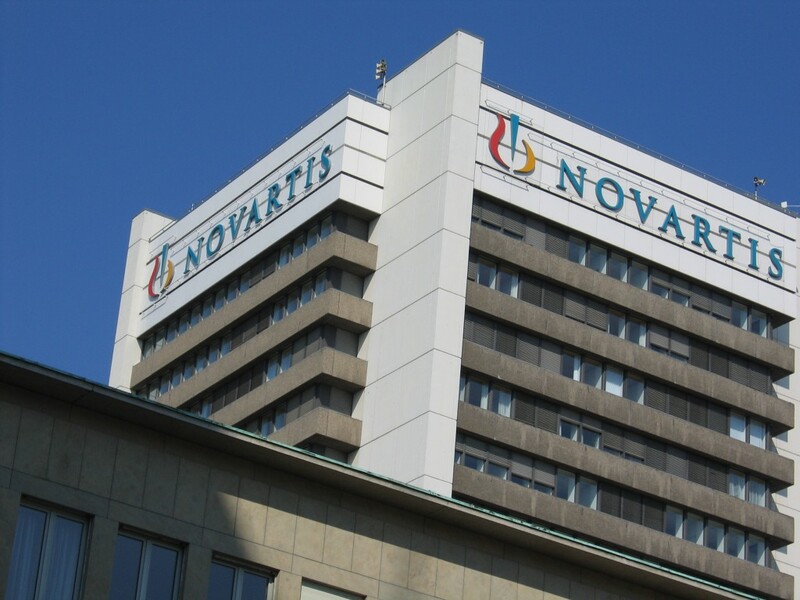 Health Right Network Korea, asserted that MoH immediately suspend reimbursement of the drug, condemning Novartis’ continued illegal kickback to the doctors. Patent on Gleevec expired on 2013, and various generic form are available with much lower price. 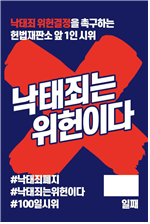 We, in solidarity with Health Right Network Korea, believe that strict and fir punitive measure for pharmaceutical company’s illegality is necessary, to secure people’s health right in Korea. 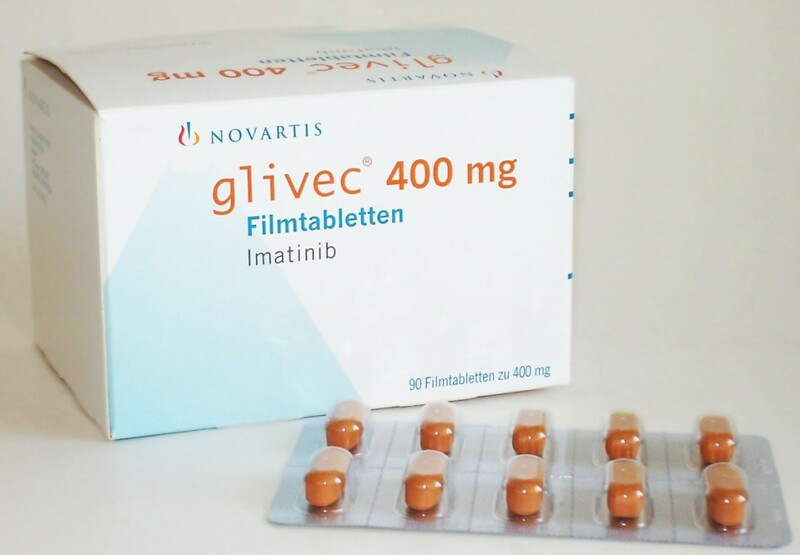 SEOUL, April 10 (Korea Bizwire) – South Korea’s health authorities are considering a suspension of health insurance reimbursement for imatinib, a highly effective leukemia drug sold under the brand name of Gleevec (or Glivec), after its maker Novartis was found to have provided illegal kickbacks to doctors. The Swiss multinational pharmaceutical company was investigated by prosecutors in February of last year for allegedly providing unlawful rebates to local doctors amounting to 2.59 billion won ($2.62 million). In August, six incumbent and former executives of the company were indicted. South Korea operates on a two-strike policy for companies providing illicit rebates as a punitive measure. Under the terms of the policy, offending drug companies have insurance reimbursements suspended for their products for a year for first-time violation, and indefinitely if another violation occurs within five years. Imposing the measure would discourage the prescription and use of Novartis drugs, and greatly reduce the company’s sales in South Korea. But at the same time, it could add a bigger burden to patients willing to continue with the medication, as it would have a high price tag, leaving health authorities in a dilemma. In fact, representatives from the Korean Leukemia Association petitioned the Ministry of Health and Welfare recently, requesting that it impose a fine on the pharmaceutical company instead of a reimbursement suspension, reported Yonhap News Agency Sunday. However, those with an opposing view demand that government should stick to its punitive measure, especially since there are other substitute drugs and generic imatinibs for leukemia. “There are some 30 biosimilar imatinib generics in the market in addition to other new drugs for leukemia treatment. Making exceptions would leave the laws vulnerable to future debate,” said an industry official on condition of anonymity. Experts from South Korea and other countries argue that government intervention is needed in the tobacco industry because there is insufficient information about the risks of smoking and because secondhand smoke is harmful. An international symposium designed to assess smoking prevention policies and to seek directions for development is scheduled to take place at the InterContinental Seoul COEX in Seoul on Mar. 28. Domestic and foreign experts in the areas of tobacco and smoking prevention held a press conference at the same location on Mar. 27 at which they argued that the government needs to regulate tobacco and that such regulation would promote economic development. “There is inadequate information, since people don’t know much about the risks of smoking, and tobacco consumption has externalities that harm the health not only of smokers but also of others through secondhand smoke. Since this leads to a market failure and cannot be left to the discretion of the market, from an economic standpoint, government intervention is appropriate,” argued Frank Chaloupka, a professor of economics and health policy at the University of Illinois who was the first speaker at the press conference. “Regulation of tobacco does not have a negative effect on the economy, but it in fact has a positive effect by reducing medical costs, improving productivity and promoting economic development,” Chaloupka added. He also argued that policies designed to regulate tobacco would help redress the health inequality among low income earners. “Poor and vulnerable members of the population smoke more cigarettes, which worsens the health gap and health inequality. Regulation of tobacco also helps mitigate this,” Chaloupka said. His proposals for South Korea were to keep strengthening tobacco regulations by increasing the price of tobacco and to invest more of the proceeds of the tobacco tax into the areas of preventing smoking and promoting health. One of the South Korean experts present was Cho Seong-il, chair of the Korean Society for Research on Nicotine and Tobacco, who argued that while various South Korean anti-tobacco policies were having an effect, the most effective of these was increasing the price of tobacco. During the symposium on Mar. 28, Katia Campos, a technical officer at the World Health Organization’s Regional Office for the Western Pacific Region, will use a presentation to highlight the six globally proven methods for regulating tobacco: monitoring the use of tobacco, protecting nonsmokers from tobacco smoke, giving smokers assistance, offering warnings about the risk of smoking, banning tobacco advertising and raising taxes on tobacco. 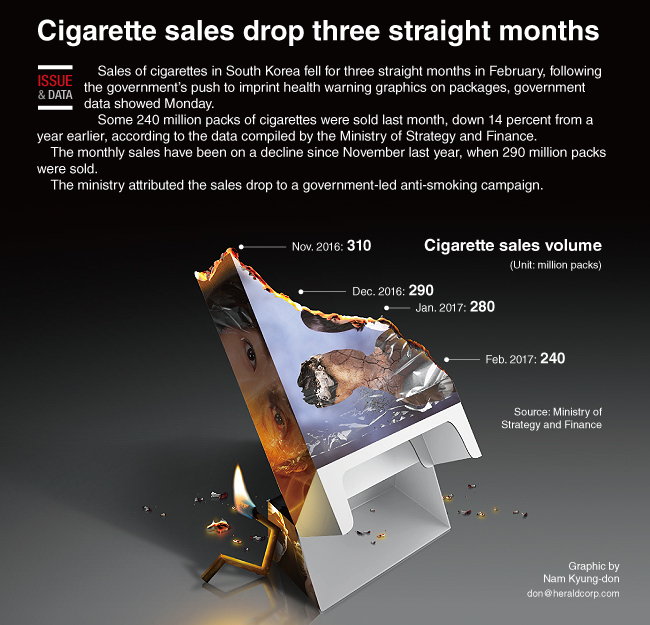 #tobacco_control_policy #pictorial_health_warnings Sales of cigarettes in South Korea fell for three straight months in February, following the government’s push to imprint health warning graphics on packages, government data showed Monday. Some 240 million packs of cigarettes were sold last month, down 14 percent from a year earlier, according to the data compiled by the Ministry of Strategy and Finance. The monthly sales have been on a decline since November last year, when 290 million packs were sold. The ministry attributed the sales drop to a government-led anti-smoking campaign. Young people gathered on Aug. 31 at the Future Office at Seoul Innovation Park, located in the Eunpyeong District of Seoul, to share their candid opinions about South Korea’s low birthrate with a group of South Korean lawmakers. “I don’t want my children to inherit the kind of life I’m leading right now.” –Kwon Ji-woong, chair of the steering committee of the Seoul Youth Policy NetworkAround a dozen young people gathered on Aug. 31 at the Future Office at Seoul Innovation Park, located in the Eunpyeong District of Seoul, to share their candid opinions about South Korea’s low birthrate with a group of South Korean lawmakers. The lawmakers are members of a National Assembly research forum that aims to find ways for lawmakers to help South Korean society overcome its extremely low birthrate.Rep. Yang Seung-jo and Rep. Kim Jeong-woo, both lawmakers with the opposition Minjoo Party of Korea, and Yun So-ha, a lawmaker with the opposition Justice Party, organized the meeting to hear from young people – the people who are, or rather aren’t, having children – about how to fix the low birthrate. “A low birthrate is a statement by the majority of the members of a society that they do not want to perpetuate their current way of life. It amounts to a society deciding to commit suicide,” said Kwon, who is 28, during the meeting. “For structural reasons, young people who are able to enjoy the normal lives enjoyed by our parents’ generation – of dating, marrying and having children – are becoming a minority. Government policy should also begin by acknowledging the reality that young people are joining the work force later and are disinclined to get married, rather than demanding young people to get a job as soon as they graduate and to get married once they reach a certain age,” Kwon suggested. Lim Gyeong-ji, 28, chair of the Min Snail Union, says lack of housing for young people is a reason for the low birthrate.“Since young people have low incomes and have to pay rent, it’s not very likely that they will be able to save enough money to buy a house. Instead of always coming up with supply- and loan-focused housing policies that promote home ownership, we need policies that can provide a stable lifestyle even for people who remain tenants their whole life and never manage to buy a house,” Lim said. “Not long ago, the new chairman of the Korea Student Aid Foundation said that debt is what motivates people to work hard. But the reality is that young people face so much pressure to pay back their debts that it’s hard for them to picture a normal future,” said Han Yeong-seop, 36, director of the Youth Money Habit Training Center. Han argues that the fact that a significant number of young people are going into debt to cover the cost of university tuition, housing, and living expenses is the main reason that they are putting off or even giving up on marriage and children. “I’m over 30, and I’m dating someone, but even I’m still not sure whether I should get married. Rather than going on about how the low birthrate is a problem, the government and politicians need to take a careful look at why young people are not getting married or having children,” Han said. The three lawmakers who organized the meeting said they will listen carefully to the difficulties that are actually faced by young people in a low-birthrate society and will attempt to address those difficulties through government policy. They added that they believe that this meeting should be taken as an opportunity not to simply say that Koreans need to have more children but to look at the structural problems in South Korean society. 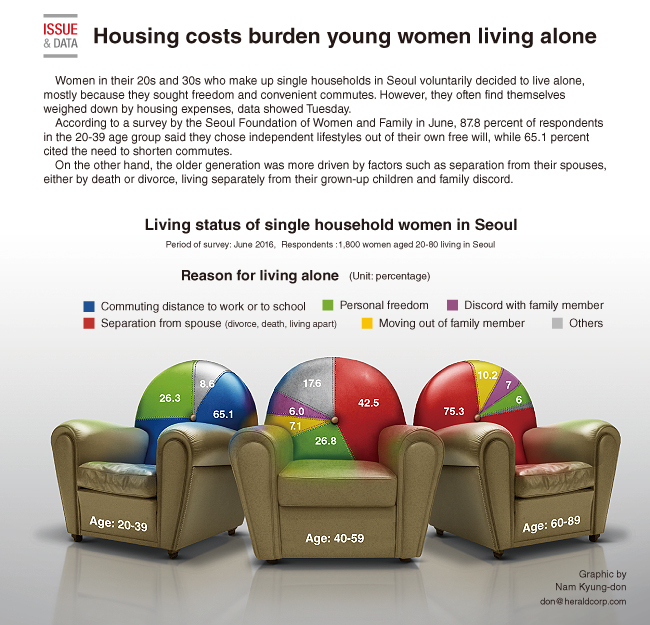 Women in their 20s and 30s who make up single households in Seoul voluntarily decided to live alone, mostly because they sought freedom and convenient commutes. However, they often find themselves weighed down by housing expenses, data showed Tuesday. According to a survey by the Seoul Foundation of Women and Family in June, 87.8 percent of respondents in the 20-39 age group said they chose independent lifestyles out of their own free will, while 65.1 percent cited the need to shorten commutes. On the other hand, the older generation was more driven by factors such as separation with their spouses, either by death or divorce, living separately from their grown-up children and family discords. Among the 500 respondents of the 40-59 age group, 55.6 percent said that they started to live alone due to family splits. The corresponding figure was much higher for those 60 and above, at 92.5 percent. Meanwhile, 74.2 percent of those who make up single households in their 20s and 30s said they faced the financial burden of housing costs. The reason the South Korean government has been left resorting to public “appeals” to overcome the low birth rate crisis stems from the fact that the rate has remained stagnant despite various measures to raise it over the years. The total fertility rate for women of childbearing age (15 to 49) stood at 4.53 in 1970. It fell steeply through the 1970s and 1980s before hitting rock bottom at 1.08 in 2005. While it hasn’t fallen any further since then, it also has shown almost no rebound in the ten years since. Last year, the South Korean birth rate was just 1.24. In terms of numbers of newborns, the decline has also been dramatic: from one million in 1970 to 438,000 last year. As of 2014, South Korea registered the lowest birth rate among Organisation for Economic Co-operation and Development (OECD) member countries. Maintaining the current population would require a replacement birth rate of 2.1. Countries that fail to achieve this level are called “low-birth rate societies”; those with a rate below 1.3 are called “ultra-low birth rate societies.” South Korea was already considered a low-birth rate society by 1983, but it was not until 2005 that it began vigorously pursuing measures to raise the birth rate. Since then, administrations have come out with measures to combat the low birth rate every five years – but the young couples who would be having the children are feeling little effect from them.In addition to number of newborns, declines have been occurring for most major indicators for low birth rate. The number of marriages between Jan. and May 2016 was down by 9,000 from the same period the year before. Employment conditions have failed to improve for young people, with the youth unemployment rate rising year after year (10.3% as of June). The number of women aged 25 to 39 – considered the most likely to have children – fell from 6.25 million in 2005 to 5.26 million last year.In announcing its third framework plan in Dec. 2015, Seoul set a total fertility rate target of 1.5 by 2020. Initially, it had pledged measures to increase the number of newborns this year to 445,000. The plan was to increase births by around 8,000 per year to reach the target of a birth rate of 1.5. But experts warn that with little impact perceived from the current measures, the number of births could drop below what has been called the “Maginot line” of 400,000.